They say that rain on your wedding day is good luck! If you are planning a spring wedding, it is a must that you plan for the possibility that it might rain. Whether you think that it’s a good or bad thing, here are a few ways to make sure your wedding goes smoothly and that you and your guests stay dry. Purchasing umbrellas for the wedding party is a great idea just in case of inclement weather. Consider looking to buy them in bulk online to bring the cost down. Also, try to find clear umbrellas. That way if it does rain, you can use the umbrellas to your advantage in your photography. 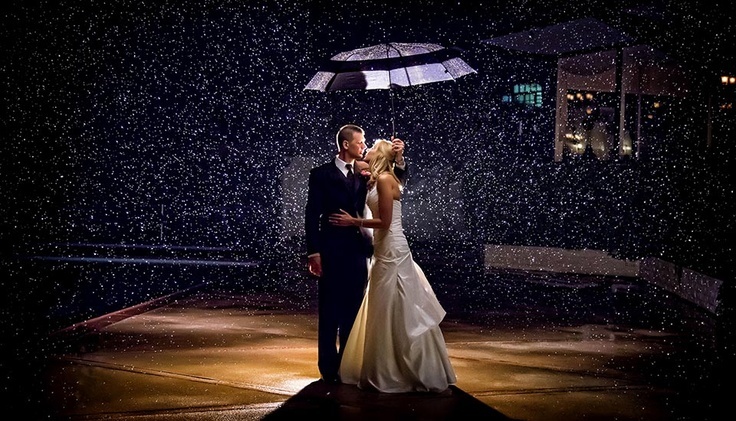 There have been some beautiful shots captured during rainfall at weddings! If you are having a ceremony and reception on the same property, but there is a walk between them, a great way to make sure guests stay happy and dry is to provide transportation. You never know when it might start raining and your guests could be caught walking to your reception during a downpour! Although there is a chance that the weather might be perfect, be sure that you have an indoor option for both the ceremony and reception. It would be awful if you put all that time and energy into planning just to have it rained out. Now, you can still plan to be outdoors, but just have a back-up plan to make sure you have all of your bases covered. Although we can’t predict the weather and you may have wedding day rain, with these bad weather tips, your big day is sure to go smoothly!